Tugboat Bohio and a fleet of vessels await entrance to Gatun Locks, with the Atlantic Ocean in the far distance, October 9, 1913. This map from the A.B. 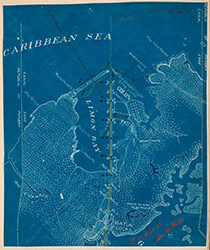 Nichols Collection shows the location of the west breakwater and the proposed location of an additional east breakwater at the Atlantic entryway to the Canal. 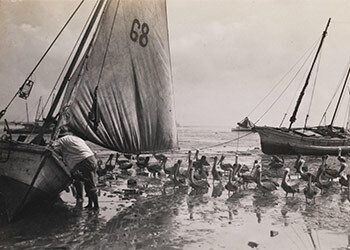 Though the Canal is often perceived as running from east to west, ships actually enter the Canal from the Atlantic Ocean/Caribbean Sea from the north and travel southeast to the Pacific Ocean. 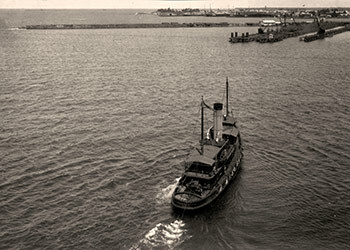 Tugboat approaches Panama Railroad piers at Cristóbal. Colón was built in 1850 as the terminus of the Panama Railroad. 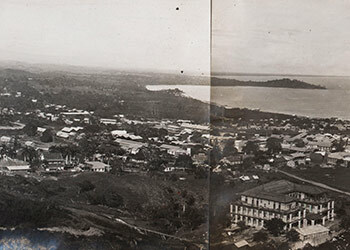 Cristóbal, which is part of the city of Colón, became the Atlantic port of entry for the steamships that brought most of the labor and materials used to build the Panama Canal. 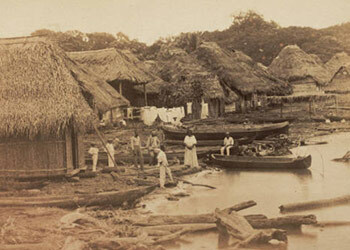 Mouth of Rio Chagres – residents in front of thatched huts, late 19th century. The Chagres River runs from its headwaters near the Continental Divide in the dense central jungle of Panama to the Caribbean Sea. The placid scene that greeted French engineers and planners at the mouth of the river, shown here, belies the raging, uncontrolled runoff that occurred when heavy rains in the mountains caused the river to rise as much as 25 feet in 24 hours. 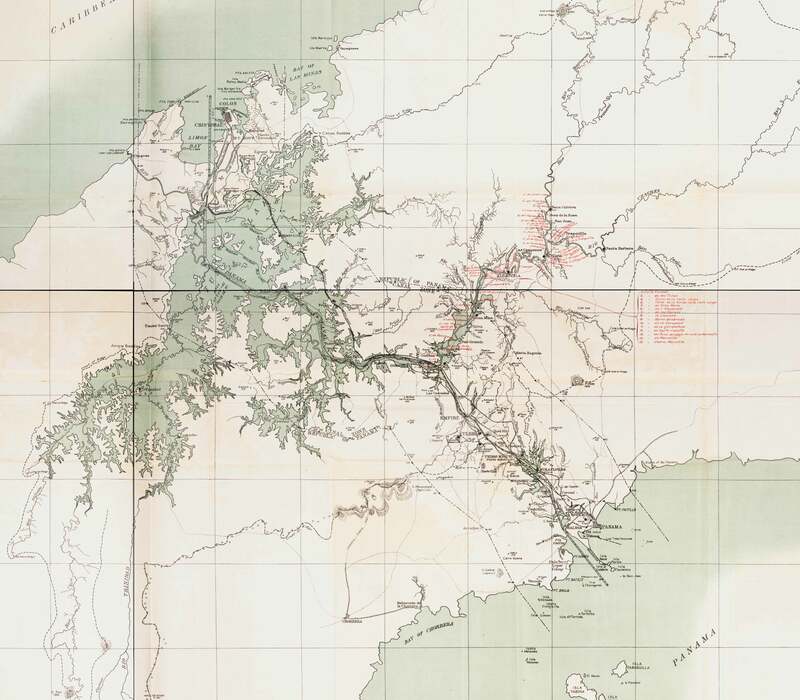 To build the Canal it was essential to control the Chagres River. 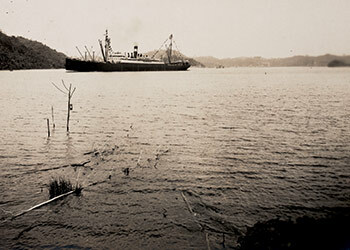 A lone tug, the Gatun, made the first passage through the Gatun Locks on September 26, 1913. To test the commercial capacity of the locks, on October 9, a fleet of 13 dredges, barges, pile drivers, and tugboats was raised all together through the locks from the Atlantic side 85 feet up to the surface of Gatun Lake. 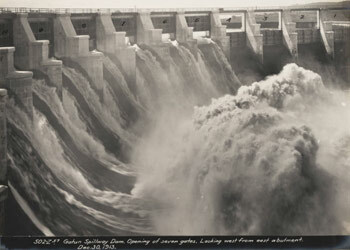 The Gatun Dam, which created Gatun Lake, was built between 1907 and 1913 to contain the Chagres River and to provide power to the Canal. 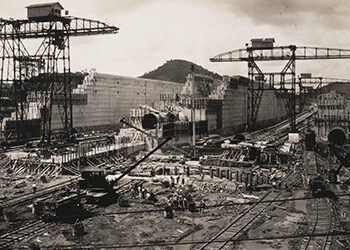 Over 22,000,000 cubic yards of material excavated from the Canal was used to create Gatun Dam, at the time the largest earth dam in the world. The SS Cristobal crosses Gatun Lake on a trip through the Canal, August 3, 1914, several days before the official Canal transit of her sister ship, the SS Ancon. Damming the Chagres River created Gatun Lake, a 164 square mile lake that was the largest man-made lake in the world at the time. Ships travel two-thirds of the way through the Panama Canal across the lake before reaching the Culebra Cut. 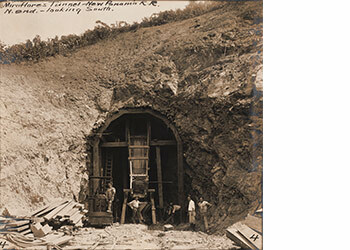 Workers build a tunnel for the New Panama Railroad, circa 1908. 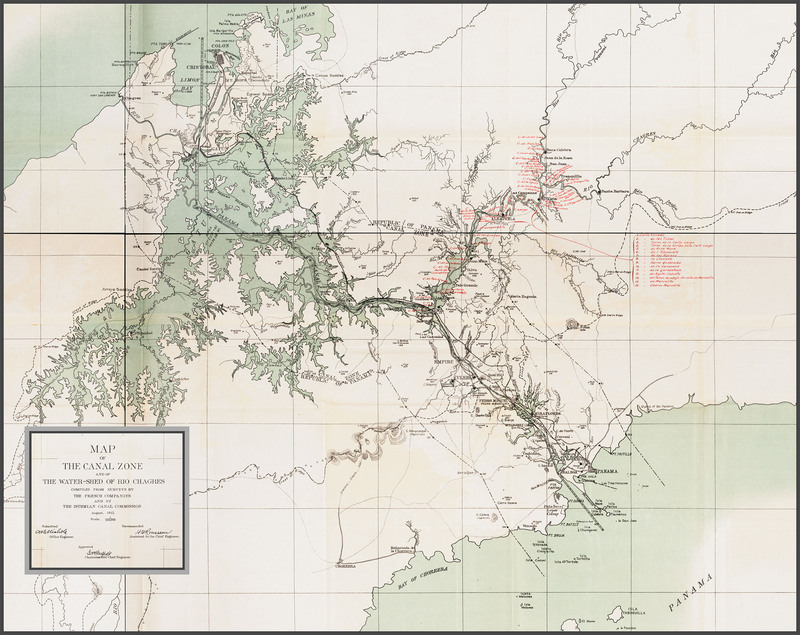 The plan to dam the Chagres River required moving the original railroad to a new location to accommodate the new Gatun Lake. Hundreds of bridges and tunnels were built for the new railroad, which was completed in May 25, 1912. 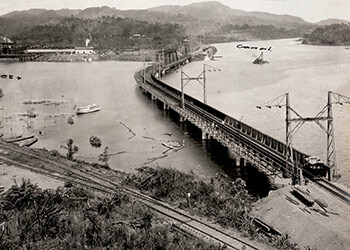 Electrical transmission line across Gamboa Bridge completed, April 21, 1914. With the creation of Lake Gatun the site of the original French-built Gamboa Bridge was submerged. A new, much higher railroad bridge was built across the Chagres River along the Canal at Gamboa. View from Mt. Zion of the town of Culebra, overlooking the Culebra Cut, circa 1911. The town of Culebra served as the main headquarters for the Canal project. It overlooked the most difficult nine miles of the 47 mile Canal, the Culebra Cut. The Cut sliced through the continental divide at its lowest point, between Gold Hill and Contractors Hill, 333.5 feet above sea level. 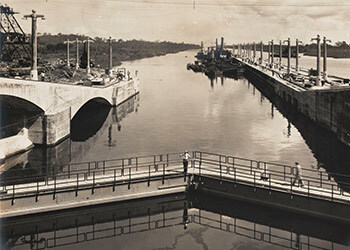 Construction of locks at Pedro Miguel, November 10, 1910. The locks at Gatun have three chambers that lift boats 85 feet from the Atlantic to the surface of Gatun Lake. At the Pacific end of the Canal, the Pedro Miguel locks are a one-step lock system that lifts or lowers ships 31 feet to and from the Culebra Cut and Lake Miraflores. The Miraflores Locks, on the Pacific end of the Canal, have two sets of chambers that lift or lower ships 54 feet. Ships travel across Miraflores Lake between Miraflores Locks and Pedro Miguel locks. 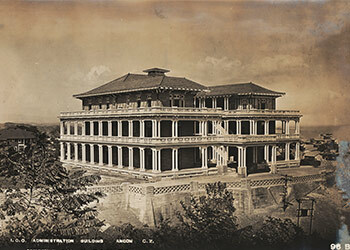 Isthmian Canal Commission Administration Building, Ancón, 1908. Ancón, to the north of Balboa and Panama City, was the site of the administrative offices for the Isthmian Canal Commission. It was also the location of the historic Ancón Hospital, built on Ancon Hill by the French and later expanded by the Americans. Panoramic view of Panama City from Ancon Hill. Founded in 1518, Panama City is the capital of Panama. 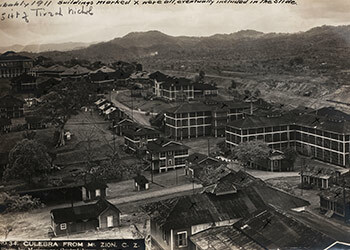 During the Canal construction, Panama City was outside the boundaries of the Canal Zone and workers headed to the city’s 200 saloons and numerous brothels to blow off steam. Low tide on Panama Bay. High tide on the Pacific side of the Canal often ranges from 12 to 18 feet, while high tide on the Atlantic side is often less than one foot. Building a sea-level canal rather than a lock canal would create problematic currents within Canal and would require tidal gates or some other method of mitigating the negative effects of the currents. For centuries, the narrow Isthmus of Panama seemed an ideal place to connect the Atlantic and Pacific Oceans. A French attempt at a ship canal in the late 19th century succumbed to tropical disease and financial problems. The U.S. took over the monumental challenge in 1904, opening the 50-mile-long Panama Canal 10 years later on August 15, 1914. 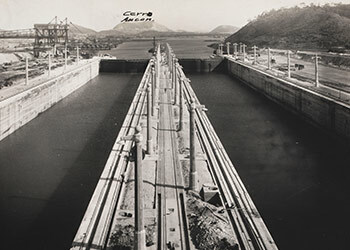 In the 100 years since, more than 1,000,000 ships have passed through the Panama Canal.